It’s a story so commonly told it’s almost not worth noting: young female singer/songwriter likes country, also likes pop, decides to make a Nashvillian record combining dual interests singing about life, relationships, and how both can be tough sometimes. 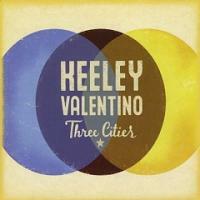 But where lesser talents rely on vocal acrobatics and slick production, Keeley Valentino’s Three Cities draws from simpler wells and ultimately succeeds where so many others fail. At their core, Valentino’s songs present a refreshingly lean distillation of country’s ideas, and having settled on the what leaves room for she and Mangano to play with the how to consistently excellent results. Arrangements expand and shrink as needed, all the while guided by Valentino’s just-countrified-enough vocals, all delivered with the kind of confident vibrato that separates the real thing from the countless pretenders on country radio: sweet without being twee, endearing without pandering, her talent used as a weapon rather than as a crutch. And this comes in handy time and again on Three Cities, as the title refers literally to the three cities that shaped her youth (Nashville, San Francisco, Los Angeles) but points metaphorically at the country, folk, and pop that ultimately shape her music. Given the generally disposable nature of most modern pop-informed country (and country-informed pop), Keeley Valentino would seem to have taken on an impossible task: make a work of undeniable musical art using the tools of the easily dismissed, and all the while have the hooks and I-IV-V songcraft work in her favor. In lesser hands, such an ambition could have easily degenerated into a laughable ball of Hallmark-worthy cheese; Valentino went in the opposite direction, delivering a case study in the good of such things.